There’s been a lack of blogs lately thanks to RSI in my right wrist (one of the occupational hazards of journalism) but after a stern talking-to from the doctor, I’ve promised to mend my ways with proper posture etc. 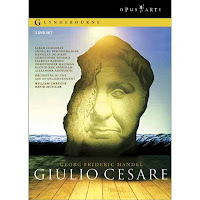 Anyway, this is a quick recommendation for a wonderful DVD we watched the other weekend – David McVicar’s production of Handel’s Giulio Cesare for Glyndebourne Festival Opera. We were both kind of dreading hours of da capo arias, but having read this review, we faced our fears, and found this to be a superbly dramatic production, more alive than any Handel we’ve heard, and with some gorgeous singing from the likes of Sarah Connolly and Angelika Kirchschlager. This was a warm-up for our impending trip to Drottningholm for Ariodante, where we’ll finally get to see a Handel opera fully staged. The cover of that DVD is so creepy--is that a death mask?! I'm sorry your arm is hurting! Take it easy! Maybe you could get one of those dictation programs (ie where you speak into a microphone and the word processor imputs the words). I don't know how well they work or how much they cost but that could be a big help in the long-run. Hello Eliza, I'm glad to report that I'm muc better - just swapped my mouse to my left hand for a week and that was enough to rest the dodgy wrist!